In the recent past, rapid growth in the urban areas has led to asphalted roads and stone slabs or pavers for footpaths. This accounts for nearly 10% of the total area of Bangalore. Consequent to this, the rainwater run-off has increased and ground water recharge has declined. As the roads are built sloped towards the sides, rainwater falling on the road is guided to the side drains. When it rains, water flows from the apex to the sides and collects in the sidewalk area and subsequently flows to the storm water drains. To increase ground water recharge by percolation and decrease the flooding of storm water drains, an infiltration trench could be built by the side of the drain all along the road, wherever possible. The infiltration trench can be 2 feet wide and 2 feet deep and filled with pebbles or aggregates with a top layer of coarse river sand. As the rainwater from the road flows into the infiltration trench, water percolates into the ground. During heavy rainfall, excess water spills over to the storm water drains. The infiltration trenches store water temporarily during rainfall and later for infiltration. These infiltration trenches may be exposed as walk ways or paved with inter-locking pavers, specially designed with gaps in between for water to flow into the infiltration trenches. Water harvesting methods in parks and open spaces involve micro-watershed management methods that allow rainwater infiltration and percolation into the ground. 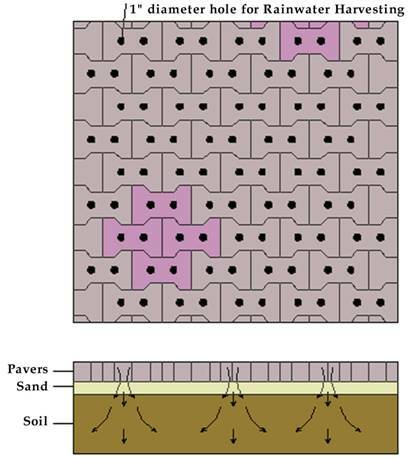 The runoff has to be minimized by providing adequate number of percolation pits and dispersion trenches. In large parks, storage of rainwater in small ponds is also possible since the ponds can be integrated with the landscape of the park. Mapping of the contours, planning for rainwater outflow in consonance with natural drainage patterns, identifying appropriate areas for percolation pits / dispersion trenches will be required. Ground water recharge in parks can be enhanced by a simple technique of providing recharge pits or a trench. Width of pit: 1.2 to 1.5 m. Depth: 2.5 to 3.0 m.
Material: 40-60 mm coarse gravel followed by 20 mm aggregates and 2 mm sand. Pits are conveniently made at suitable low-level micro-watershed locations as collection centers of surface runoff. A splash pad is provided on top of the sand layer to cut off the velocity of entry of water to the pit. The number of such pits is based on the park area and the small rivulets dissecting the landscapes into micro-watersheds. Creation of water harvesting ponds in concave depression and low-lying areas. · Allowing groundwater recharge by the creation of seepage pits. · Allowing surface runoff to enter into existing wells or artificial water bodies. Surface runoff water should be trapped in ponds, tanks and lakes when available, so that it can be used for maintenance during dry periods. This practice is similar to dry land technology of agricultural belts. Low-lying areas and drainage channels are earmarked and convenient micro-watersheds are prepared. Water harvesting is followed based on natural flow and surface accumulation of the runoff water. Water follows the lowest contour gradient available for that area. These structures not only provide water for the park, but also increase groundwater recharge. Providing a bore well in these areas will enhance the availability of water in its vicinity. Rainwater run-off from open space and paved areas can be stored in underground sumps by filtering through sand-bed filters and guiding the filtered water through channels. Layout refers to a geographical area encompassing sites, roads, drains, civil amenities and parks. Rainwater Harvesting in layouts can be done using the 'Cascade Capture Method'. In this process, rainwater can be harvested on a plot or through recharge of ground water. The run-off from the plot could be captured by storm water drains and directed into artificial infiltration or percolation pits. The overflow from the storm water drains and infiltration system could be captured in lakes and tanks. The method of rainwater harvesting involves contour mapping, drainage pattern, determining a storage point / ground water recharge and ensuring segregation of sewage / sullage from storm water run-off.